Scott was intrigued withnature and it's complexities at an early age, which led him to earn a Bachelors of Science degree in Biology. This training makes itself evident in the intricate detail that has become the trademark of his sculptures. "I Believe that the detail that separates one species from another is nature's art. I attempt to portray my subjects in the most realistic fashion possible; so that nothing detracts from the inherent beauty of the animal." 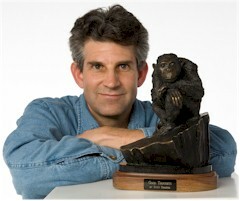 Scott began sculpting in 1987, at the age of 24. He is a Colorado Native, and currently makes his home in Grand Junction, Colorado. Scott's work has been profiled by Rocky Mountain Public Broadcasting in their series Western Bounty. His work can be found in public and private collections throughout the United States and abroad. Public purchases include a life-size American Alligator installed at the University of Florida's Ben Hill Griffin Stadium in honor of the school's 1996 National Football Championship; Florida historical figure Bunk Baxter and three alligators commissioned for the Orange County Regional History Center in Orlando, Florida; and most recently, his Brown Pelican entitled "The Port Authority" was purchased by the Loveland Sculpture Group for donation to the City of Loveland, Colorado.